Our series is called Franklin Electric Reading Series and takes its name from the co-working space it’s held in, Franklin Electric. The founders are Jordan Bolden, Will Frazier, Victoria Kornick, Jessica Marion Modi, all of whom still run the series. We host 4 to 6 readers each month. At Franklin Electric, a coworking space at 650 Franklin Ave.
It’s a monthly reading series. It usually takes place on the second Thursday of the month. We welcome submissions and solicit readers as well. We put together our events based on genres, themes, or communities of writers, and some events are reader-curated. Our goal is to keep the series as diverse and autonomous as possible. We welcome writers to read with their collaborators and peers as a way for them to participate more fully and bring new voices into the space. We also want our series to reflect the community, so we value readers with ties to Crown Heights. We accept submissions on a rolling basis every season, so that we are able to accommodate as much of the work we believe in as possible. Also there is free beer & cheese. 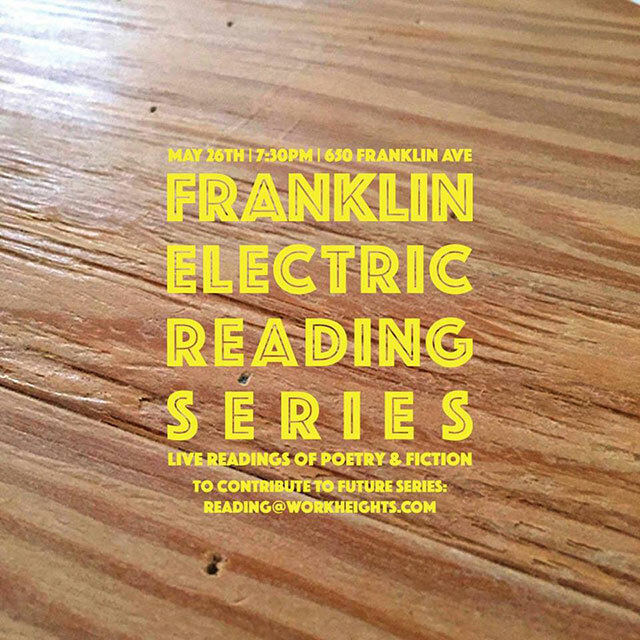 The next Franklin Electric Reading Series is scheduled for 7:30 p.m., Thursday, May 26, 2016 at Work Heights (650 Franklin Avenue, Brooklyn) and features Laura Cresté, Linda Harris Dolan, Caroline Rayner, and Kem Joy Ukwu.